Handloom weavers of the country are a worried lot. Reason: the Ministry of Textiles has proposed to include mechanised weaving processes in the definition of handloom in its legislation. Weavers fear this will threaten their livelihood and eventually bring an end to the age-old tradition. According to the ministry, the new definition will allow development of new techniques that reduce the drudgery which the profession involves. Most weavers suffer from body pain, decrease in hand-grip strength, pulmonary problems and even chronic bronchitis. To minimise their problems, many handloom weavers have powerlooms in their backyard. Also, many weavers use different machines as per their convenience—pneumatic relieves pressure on weavers’ legs, jacquerad is designed to give better acceleration to the loom, motorised peddling gives motion to the loom. Ministry officials say weavers should use machines for their own good. Handloom commissioner Balvinder Kumar says machines will reduce the drudgery. However, he admits that it would affect artistry and pave the way for power loom. “The proposal to change is a conspiracy to kill our tradition by indirectly encouraging use of power,” says Mohan Rao of Rashtra Chenetha Jana Samakhya, Andhra Pradesh-based handloom trade union. Introduction of the term hybrid loom has also irked weavers. “Nowhere in the world does the concept of hybrid loom exist,” he says. Brocade of Varanasi in Uttar Pradesh, Jamdani of West Bengal, Kanchipuram silk of Tamil Nadu, Pochampalli of Andhra Pradesh, Maheshwari of Madhya Pradesh and Ikat of Odisha are recognised the world over. So much so that the industry has been accorded the status of national heritage. Allowing mechanisation will make differentiation between handloom and powerloom difficult for the consumer, and thus ruin its uniqueness, say weavers. This apart, the industry generates employment second only to agriculture. As per the third national handloom census, 77 per cent of the workers are women. People belonging mostly to Scheduled Castes, Scheduled Tribes and Other Backward Castes are involved in the profession. However, in the past two decades there has been a glut of powerloom fabric in the fashionable world and consumers’ preferences have changed. This has led to a decline in the industry. As per the second handloom census, 1995, as many as 6.5 million weavers were involved in the profession. 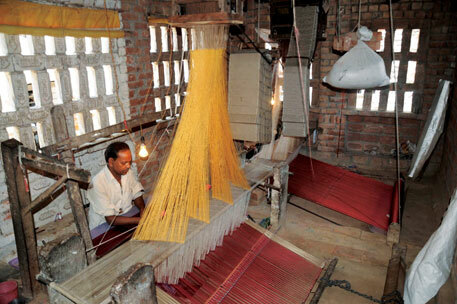 The number dipped to 4.3 million in 2009, the third handloom census shows. “The change will make many more weavers unemployed,” says Rao. Objections to the new definition have forced the ministry to form a sub-committee in May under the chairmanship of additional development commissioner Dinesh Kumar. The committee will find out the available options of modernisation which have been adopted in different parts of the country. However, the need is to make sound investments and involve private players in the marketing and supply chain, the working group of planning commission states. “It’s not that weavers are not concerned about the problems such as drudgery and diseases. But it should not be at the cost of inclusion of power. The way textile ministry plans to impose change can ruin our handloom heritage,” says Rao.